The buffalo once roamed freely across the American Plains. Massive, majestic creatures, the buffalo helped sustain Native American tribes living on the Plains through the use of their meat for food, and their hides for shelter and clothing. The US Mint pays homage to those bygone days on the 2015 1 oz Gold American Buffalo Coins. These coins are available from Silver.com today from the First Strike series, designating that the coins were received by PCGS within the first 30 days of the coin’s release. Each coin has also been graded as Mint-State 70 by the PCGS, meaning that they are in perfect condition and do not have any abrasions or scratches on their surface. The 1 oz Gold American Buffalo is one of the most popular gold bullion coins offered by the United States Mint. On one side of the coin is an image of Black Diamond, the largest buffalo ever to reside at the Central Park Zoo in New York City in the early 20th century. On the opposite side is James Earle Fraser’s rendition of an American Indian chieftain, as first used on the 1913 Buffalo Nickel. On the reverse of the 2015 1 oz Gold American Buffalo coin is the image of Black Diamond. The buffalo’s image is surrounded by the engravings “United States of America,” “E Pluribus Unum,” and “In God We Trust.” The face value, weight, purity, and metal content are also engraved on this side. The obverse of the coin features Fraser’s American Indian depiction. Engravings on this side are simple, and include only “Liberty” and the year of minting. The Gold Buffalo Coin series was first introduced in 2006. Silver.com is dedicated to creating happy customers. 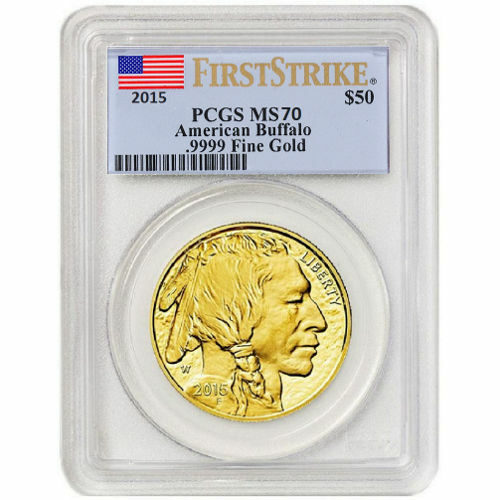 If you have any questions about the First Strike 2015 1 oz Gold American Buffalo Coins (PCGS MS70), don’t hesitate to call our associates at 888-989-7223. You can also speak with us online using our live chat.